Following on from Michael's excellent blog post recently, titled 'The Life of Riley', I thought I'd return to the new series of posting a photo taken during last winter, and giving a little bit of a background to the image. According to the image file data, this was shot on Decenber 19th at 3.23pm last winter, that's a week before Christmas. Does anyone recognise where it could've been taken? For a start, let me give you a clue, it was taken from a chairlift. One of the many pleasures of riding a chairlift, other than getting to the top of a piste to set off skiing again, is having a spectaular view of the mountains around. Being able to work in the Alps every winter means I'm very fortunate to get to experience such views in the office. This particular chairlift is the Cote Brune high above Meribel Mottaret, looking down on a shepherds hut soon after the lift leaves its bottom station.To the side of the hut is the red piste called Venturon. At such a high altitude, this area is very isolated and exposed during snow storms, and often experiences high winds. 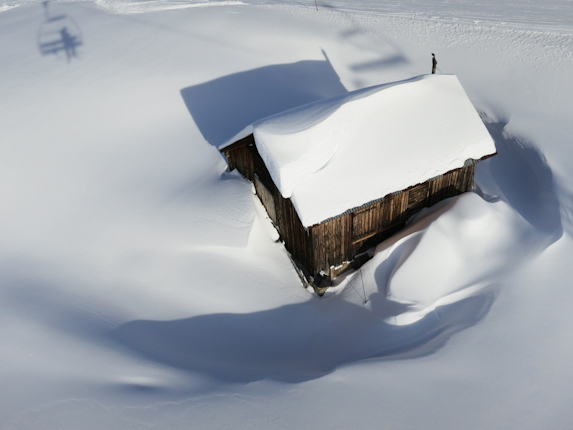 These weather conditions leaves its own signature in the snow and provides some gorgeous shapes and textures around this hut. I've photographed this hut many times before, and it has featured before and will no doubt feature again on this blog. Wow, I'm getting all fidgety thinking about the winter and the Alps again. So I better stop there. I shall post another photo again next week. If you enjoyed this short article, you might like to read another I wrote earlier this summer, click here for the link. Please feel free to share away using Facebook, Twitter or Google+ by using the social media icons. Or leave a comment below. Have a great week everyone. Martin.